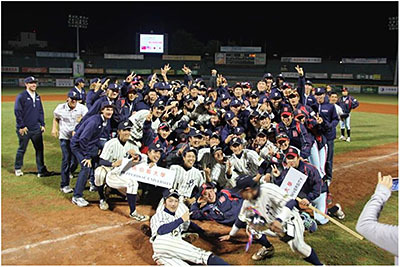 TAINAN CITY, Taiwan - The Pepperdine baseball team used a seven run third inning to defeat Dongguk University (Korea) 13-4 Saturday afternoon and win the 2013 Formosa Cup with a 3-0 record. The Waves fell behind 3-0 early in the game, but exploded for their largest run output of the tournament to take the title. Dongguk lost its opening game to Jobu 6-0, but came back to defeat Chinese Cultural in extra innings last night, giving the Korean team a shot at still taking the title with a win Saturday. The Waves put those hopes to rest quickly with their most impressive win of the tournament, though. Jobu and Chinese Cultural close the tournament with a Saturday night game, followed by the closing ceremony where the Pepperdine University Waves received their championship trophy, Jobu University 2nd, Donggug University 3rd, and outfielder Brian Langlois won the MVP of the tournament. The Formosa Cup is a four-team event hosted by Chinese Taipei Baseball Association with squads from Taiwan, Japan, United States and Korea playing three games apiece. All the games werebroadcast live on YouTube.